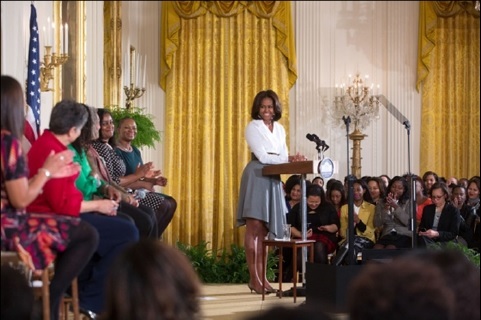 First Lady Michelle Obama delivers remarks at “Celebrating Women of the Movement,” an event honoring Black History Month, in the East Room of the White House, Feb. 20, 2015. Here, the First Lady introduces moderator Vanessa De Luca, Editor-in-Chief of Essence magazine and the panel of intergenerational women who have played a pivotal role in the civil rights movement – both past and present. In 1957, Carlotta Walls, a 14-year-old African-American girl living in Little Rock, Arkansas, elected to attend Little Rock Central High School. One of the nine students who desegregated the school, Carlotta was subjected to constant bullying, physical abuse, and violent attacks – her parents’ home was bombed in February of 1960. Shortly after, she earned her high school diploma. In 1961, Charlayne Hunter became the first African-American woman to attend the University of Georgia. Enduring everyday bigotry and racial slurs, and bottles and bricks thrown at her windows, Charlayne went on to get her degree – which has since propelled her to a successful career as a journalist with NPR, PBS, CNN, and the New York Times. 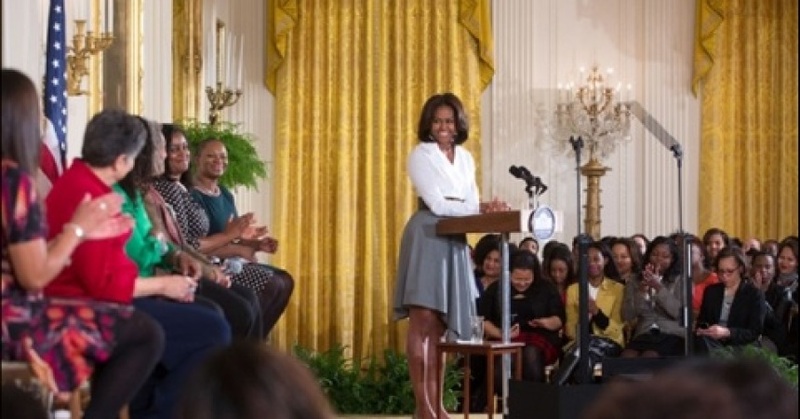 These are just two of the influential women who took part in a special panel discussion at the White House in celebration of Black History Month Feb. 20. Moderated by Essence Editor-in-Chief Vanessa De Luca, the panel brought together five women who have played critical roles in America’s progress on civil rights. They are: Carlotta Walls LaNier, youngest member of the Little Rock Nine; Charlayne Hunter-Gault, activist and journalist; Sherrilyn Ifill, president and director-counsel, NAACP Legal Defense and Educational Fund; Janaye Ingram, national executive director, National Action Network; and Chanelle Hardy, senior vice president for policy, National Urban League. But the First Lady also explained that too many of our children still face struggles related to education, and detailed the work that remains:Too many of our young people attend crumbling schools that don’t have the technology, or the college prep classes, or the college counseling they need to complete their education past high school. And too many of our young people can’t even envision a better future for themselves – or if they do, they aren’t connecting their dreams to the education they’ll need.